Which teams qualified for the UCL last 16? Anticipation and excitement has started to bubble up over who would face who in the last 16 of the UEFA Champions League knockout stages. The final round of games in the first round of the UEFA Champions League have been concluded and the group winners and runners-up have been established, giving everyone a hint of what matchups are about to take place in the next round. 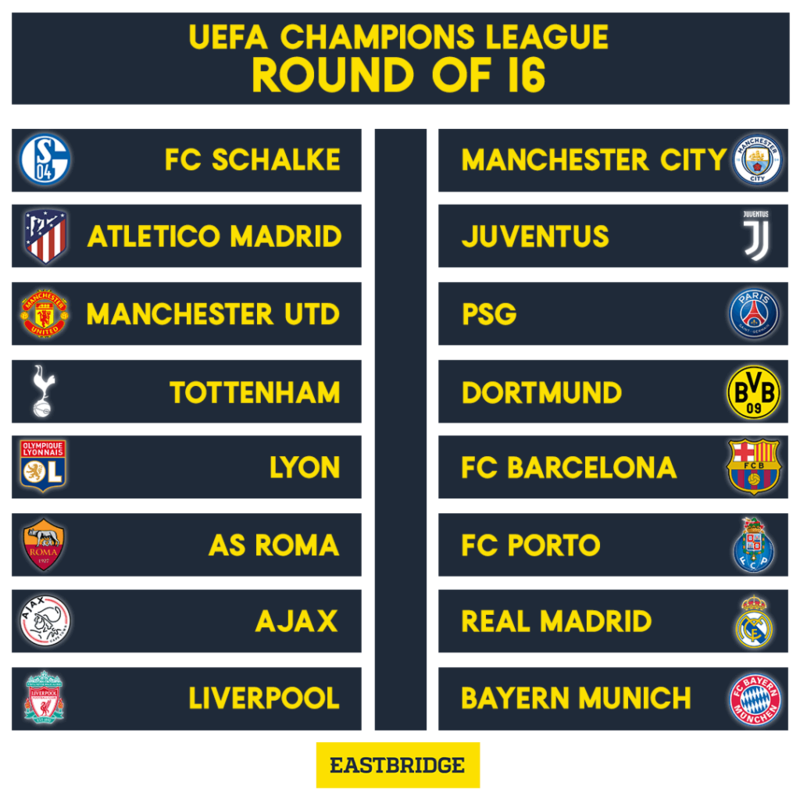 In this article, Eastbridge delivers the roundup on which sides will be drawn against one another in the Champions League knockout stages. PSG were able to gather 17 goals during the group stages following a slow start to the campaign and are now returning to their winning ways as they top the Ligue 1 standings with 93 points. Manchester United will need all the help they can get in order to survive the likes of Neymar, Kylian Mbappe and Thiago Silva. However, Man United’s victory against top Italian side Juventus gave them a glimpse of the level of greatness they once were, so PSG should also watch out for United’s strong line of defence as shown in their recent displays this season. Roma finished behind Real Madrid in the group G standings of the Champions League, however, they are currently at the 10th place in the Serie A table. Although Eusebio di Francesco has been feeling the pressure lately in the local competition, his team were still able to qualify in the last 16 of the UCL. On the other hand, Porto topped a quite vulnerable group D. Between these two, it may seem that Porto may have the upper hand, however, it’s important to consider that with Roma’s experience in this kinds of competition, they could easily win past the Portuguese side. Last season, Tottenham Hotspur managed to beat Dortmund two times in the group stages; however, the German side are currently on a role this season. Borussia Dortmund currently top the Bundesliga standings, 6 points above Bayern Munich and have only faced defeat once in 17 matches played. Meanwhile, the Spurs are quite surprising this season, placing 3rd in the Premier League table and just two points behind Manchester city. Tottenham Hotspur will need a confidence booster in order for them to proceed to the quarter finals for the first time in years. These two sides will need to prove who among them can come out successful in this fixture. Real Madrid haven’t lost a knockout fixture in the Champions League ever since their setback against Juventus during the semifinal stage three years ago. However, it can be noted that the Spanish side greatly struggled in the departure of Zinedine Zidane and Cristiano Ronaldo. Ajax could take advantage of this weakness. With the energy and pace of Ajax’s midfield and attacking ways led by fresh talents with the likes of Frenkie De Jong, Ajax might give Real Madrid a challenging test that is worth watching out for. Lyon are quite a side at the moment. They were finally able to reach this stage for the first time in 6 years. They managed to dominate the top-ranked Manchester City in an away group stage fixture before sharing a draw last month. Although Lyon are currently placed third in the Ligue 1 standings, they sit behind league leaders PSG by 15 points which showed a bit of inconsistency. Barcelona, on the other hand, are still not over their quarter-final defeat to Roma last season so it should be expected that the Spanish side will go over the top to come out victorious in this match. Bayern Munich are currently placed at the second spot in the Bundesliga standings, 6 points behind Borussia Dortmund. Bayern Munich may not be running in their best form this season but they could still be an intimidating opponent to Liverpool’s hope of succeeding in the final rounds. Bayern shouldn’t underestimate a side quite like Liverpool, a side that’s been setting the English top flight on fire this season. Liverpool are currently the leaders in the Premier League table, though they are just 4 points ahead of reigning champions Manchester City. As of now, Schalke is placed second at the Champions League Group D standings, just five points behind group leaders Porto. Still, being at the second spot in a vulnerable group doesn’t quite give off a threatening vibe especially when they will be taking on a side like Manchester City. Furthermore, the German side are currently at the thirteenth place in the Bundesliga table. However, even with all these considerations, Pep Guardiola should not take too lightly the threat of their opponents. They might be in for a surprise since the UCL knockout stage has been the most coveted level Schalke has been aiming to reach. Atletico Madrid are quite a shocking team this season. They are at the second spot in the La Liga standings, just 3 points behind league leaders Barcelona while also surpassing two of the greatest teams in European football, Sevilla and Real Madrid, by 2 and 5 points respectively. Atletico managed to concede only five goals this season but their defenselessness still remains as shown in the 4-0 battering against Borussia Dortmund during matchday three, though they managed to retaliate when they bagged the 2-0 victory when they faced each other again last month. However, they shouldn’t be too complacent as they will be taking on a team that is currently the leaders in the Serie A table, and a team with Cristiano Ronaldo in it. Excited for the Champions League knockout stages? Stay tuned to Eastbridge bet broker to never miss out on the latest updates on your favourite teams. Show your support to your sports picks by heading over to our partner VOdds to place your bets!